‘Anime + Me’ mashes up an element of my life with my favourite anime characters. Do you ever feel like you have a certain ‘vibe’ that kind of scares people? I do. Often. For example, I was walking down the hall once and when my teacher saw me he backed into his office with a worried expression. I’ve also been through numerous personal tutors. They always end up leaving. And there was that time one of my primary school teachers (out of nowhere) said I had an evil smile. 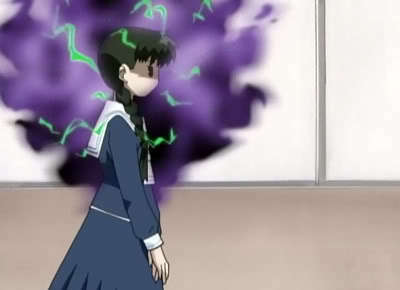 It’s almost like I have poison waves emanating from me or something… I don’t set out to have a strange vibe, I just do. It’s not of great concern to me because I’m not big on hanging out with large groups of people so there are only a handful of people who ever have to experience or really know about my ‘vibe’. I have two close friends that get my humour and oddities. I don’t feel as comfortable talking to anyone else besides these two people, except for my family who I consider myself very close to. I know my friends won’t judge me for saying silly things and I know they understand that I’m introverted and what that entails. They have never tried to change how I am. I think that’s why I can empathise with Fruits Basket‘s Saki (or Hana-Chan).Fruits Basket is a popular manga series (also an anime) that was published from 1998 to 2006. 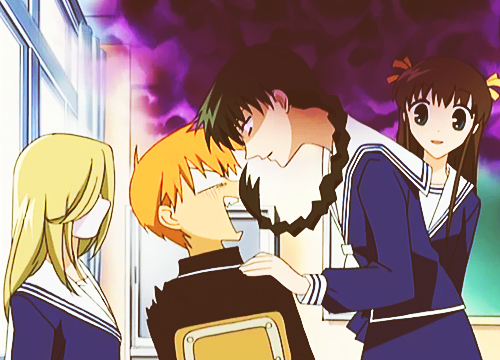 It follows Tohru Honda as she discovers the secret of the Sohma family and subsequently tries her best to free them from their curse and see them be happy. Tohru is an optimist who never wants to be of any trouble. She’s considerate and kind. Her two closest friends are Arisa and Saki. They would do anythingfor her because they value the kind of person she is just as much as she values them. Out of the three friends, Saki is the one I identify with the most. She is a generally polite person, a protective friend and she can detect electric/psychic waves and emit poison waves. I don’t have psychic energy as such but I empathise with Saki on quite a few other levels, such as her experiences of being bullied as a child, her caring attitude towards those closest to her, and her disconcerting aura. I respect how she has taken control of her rather dark ‘power’ and now uses it to help protect her friends from other people. She has accepted her power and now uses it to help others, which is a trait I admired in Kuroko in my last Anime+Me post. Saki has personality quirks and introvert tendencies that create a shield between her and other people. But there is a place within her bubble for her closest friends who she holds very dear. That’s what I love about her. I don’t much care if other people in my classes think I’m strange because I’m the quiet girl who is always reading in the corner. I know the people whose opinions I do care about are happy with me the way I am. I think that’s an attitude Saki would respect. Another year, another rambling blog post.